Dubai:Amid robust trading activity, Shuaa Capital rose on Monday, extending gains for another session after the news of a possible merger with Abu Dhabi Financial Group. Buying in Shuaa along with Emaar shares aided sentiment on the Dubai bourse. Shuaa Capital closed 13.43 per cent higher at Dh0.811, after gaining as much as 15 per cent in the previous session. Traded value jumped to Dh12 million compared to a daily average of Dh1 million. “Shuaa is a very speculative stock. We won’t be able to tell what to do with the stock after having risen by 15 per cent,” said an analyst who did not wish to be named. Shuaa Capital is in early discussions with Abu Dhabi Financial Group (ADFG) which owns 48 per cent in Shuaa, for a possible merger. Emaar Properties saw late buying in trade. Emaar Properties closed 2.14 per cent higher at Dh4.78. The Dubai Financial Market general index closed 0.60 per cent higher at 2,634.29. Dubai Islamic Bank closed 0.21 per cent higher at Dh4.83. Union Properties closed 9 per cent higher at Dh0.383. Buying in First Abu Dhabi Bank (FAB) helped the Abu Dhabi index. The Abu Dhabi Securities Exchange general index closed 0.45 per cent higher at 5,117.94. FAB closed 1.06 per cent higher at Dh15.20. Union National Bank ended 0.36 per cent higher at Dh5.52. Eshraq Properties closed 5 per cent higher at Dh0.46. Aldar Properties closed 1.06 per cent higher at Dh1.90. “Aldar sold a residential tower at an implied yield of 6.6 per cent. This goes in line with their active portfolio management strategy; recent acquisition yields have been around 8 per cent and this sale is thus creating value for shareholders,” Al Mal Capital said in a note. Elsewhere in the Gulf, Saudi Tadawul index closed 0.23 per cent higher at 8,666.69. Al Rajhi Bank ended 0.78 per cent higher at 103.40 Saudi riyals. Saudi Basic Industries Corp. closed 0.16 per cent lower at 123.40 riyals. Saudi Kayan Petrochemical Co. ended 0.86 per cent higher at 14.14 riyals. 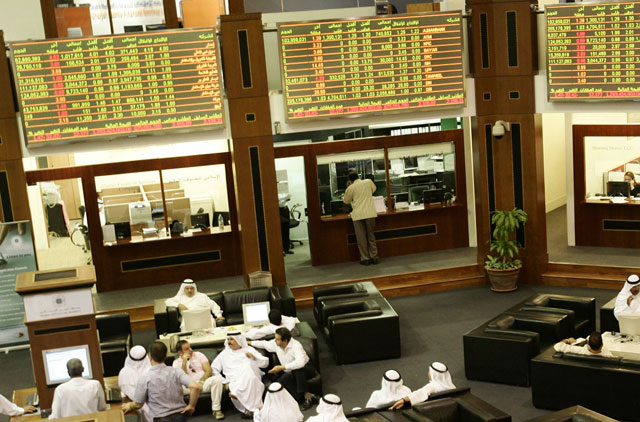 The Muscat MSM 30 index closed 0.03 per cent higher at 4,127.84. The Kuwait all share index jumped 0,37 per cent higher at 5,565.26.